Once again, I would like to thank everyone who linked up last week. I never get tired of randomness! Do you think the tissue industry has designers who are also quilters? They keep coming up with superb quilting ideas. With a little curved piecing, each of these could be great quilts! Gabriel is 10 months old. He is crawling everywhere and starting to say a couple of words. I never crave ice cream. Never. I would rather have a bowl of chips and salsa. So when I served ice cream the other night I didn't even fix myself a bowl. That is, until Christa and Jill started raving about the ice cream. Now I'm kinda screaming' for ice cream. This stuff is the best.ever! I like Jason Mraz. However, there are some lyrics in this song that always bug me. About 1/3 into the song (1:43) he says, "....it's our God-forsaken right to be loved, loved, loved..." I always think to myself: Shouldn't it be "It's our God-given right to be loved, loved, loved"? I don't know. Maybe he needed that extra syllable. What do you think? Do things like that ever bug you? Mark and I have a lawn service, and the same group of guys does about six houses on our block. The neighbor directly across the street has a different lawn service. I have been waiting for weeks to capture this on film and I still didn't get a very good picture. You see the size of the lawn, right? It's small. The guy does it on a riding lawnmower!. I had to be speedy to get a picture. Seriously. It only takes him like two minutes. I can see the benefit of a riding lawnmower....if you have something like a half acre. Tuesday's photo prompt for Project 365 was "8 o'clock." And I saw this on Instagram the other day, posted by Katy at I'm a Ginger Monkey. 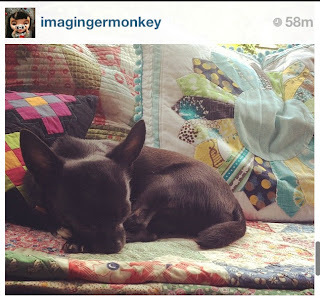 Hope she is okay with the fact that I snagged her IG picture because see that granny square pillow over there on the left? I made it for her after she kept saying such nice things about the "My Granny is Amish" quilt and now it lives in the UK! I was so excited to see it in this picture. Levi painted this mug at "Color Me Mine" a couple of weeks ago. He did such a good job. (Charlotte's bowl was in the sink and she told me I was not allowed to remove it from the sink until it had been washed....). And the blue fingernails? That's what happens when you are with your sister at a friend's house and the girls all decide to play "salon." Go with the flow and choose a good blue. Go Dodgers! I routinely mention that I like to declutter and organize. You would think by now there wouldn't be anything left to declutter and organize, but sadly, that is still not the case. However, after reading this book, I'm starting to go through the house shelf by shelf, drawer by drawer, and ask just two simple questions. Do I love it? Do I need it? I haven't gotten to my sewing room yet, which always seems to be in a state of needing a good destashing. And I wasn't quite ready yet to toss these pinked edges that came from a quilt I'm almost ready to reveal. So I put them in a cute canning jar. And I'm deeming it "organized simplicity." Do I need it? No. Do I love it? Yes. Whew. At least for now, it passes the test. Anything random happening in your life? Please share! Radically random this week! Love the Amish pillow and the ice cream! I love that mason jar idea! I buy my tissues based on the box I like. I would take the first picture in a pillow and the second as the quilt. I agree.....THE queen of the random post!! I would be over the moon if I saw my cushion peaking out in a superstar's photo! Those tissue boxes remind me of Orla Kiely designs, which makes sense for Target. Did you know that Betz White has had her graphic designs printed on Kleenex boxes? Pretty cool. 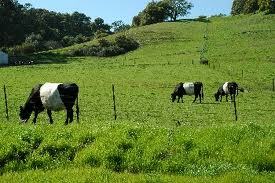 I love those Oreo cows! I've never seen them before, so I'm happy to know about them. I can just imagine how nice it would be to have a lawn service for our big yard, or even just a riding lawn mower. Nice ramdonness!!! I think there is a breed of pig that looks like an oreo cookie also - the saddleback. Uhmm, how funny would that be, to have a collection of live animals that looks like oreos. As far as my randomness, I took my horse to the beach for a ride. Yea!!!! Thanks for hosting this, I had a lot of fun writing my first random post! Great randomness, as usual, Cindy! I especially love the oreo cows! Song lyrics bug me sometimes too, especially using the word "I" when it should really be "me" or visa versa!! well, shoot! 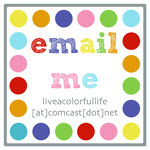 i didn't know you had this linky or i would have made my post this morning more random! cause i had LOTS of random to share... but instead tried to keep it ordered. I'd link up but I'm nervous mine doesn't work! way too cool about the amish granny pillow. that's just too fun! I love those pinked edges, too. I think I should take a look at that book. I am sorry I didn't link up today. I have been having some computer problems and consequently didn't get a post up at all today. I had some good stuff for you, too. I hope I'll be back up and running next week. 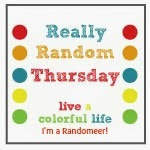 I am loving this Really Random Thursday linky party! That's all I want to do now ;-) My daughter would get a kick out of those oreo cows! Loving the random! Maybe because that's the way my brain works sometimes too! Oh can't blame you for keeping those little pinked edges. They look seriously cute stored in a jar like that! I love your random posts! Note to self...remember Thursdays are random!